bl.uk > Online Gallery Home	> Online exhibitions	> Asia, Pacific and Africa Collections	> Shewaki Minar. 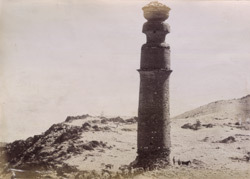 Photograph of the Shewaki Minar from the double-album of 'Photographs of Kabul and its environs' and 'Photographs of Kabul workshops', taken by the Bengal Sappers and Miners, c. 1879. This print shows a general view of the tower, presumably near the village of Shewaki, situated on the Logar River near Kabul.